So it has been over a week since the 10th year anniversary of the Sydney Latin Festival (Sydney Salsa Congress) and the buzz is still well and truly lingering. Epic crew and team Spark attacked their routines with a lot of spirit and they really pulled out performances worth being proud of. Everyone knows how scary it is to perform in front of an SLF crowd and year after year our teams take on that challenge and continue to make magic. I’m sure I speak for both Nathan & Brooke, they nailed it! I remember the hype of my first congress, the atmosphere, the people, and the music. I remember when Angela Lau came to Melbourne to promote the event and after I spoke and danced with her, I knew this was going to be special and I just knew I needed to be part of it all. At the time, I was working with a dear friend Sharon Pakir and we decided to bring a team to the event and we taught our first workshop together. After years of teaching, performing, and most importantly learning at the SLF I can’t help but feel nostalgic and grateful to have been given the chance to develop so many dancers, meet amazing people I consider friends now, teach people by the hundreds, and most importantly be given the opportunity to do what I do. The first time I presented my Metro Movers piece all those years ago, I recall the whole place erupting which was totally unexpected because it was not a purely salsa routine. The crew and I were so nervous that we all abnormally frequented the toilets like we ate a thousand dirty-dumplings and we all looked like the walking dead minus the decaying flesh, but I’m sure we smelt of it though. Years before, I decided to always stay true to myself; this was the only way I could produce my best work and truly “reach “people. It just made sense to me to bring a little bit of Hip hop to that stage as this was the realest way I could express myself. I will NEVER forget that night and I still watch that Metro Movers clip on YouTube and when I hear that crowd erupt it takes me straight back to that night, and yes, even the toilet visits. This year, I sat way up in the crowd watching our latest piece unfold and I couldn’t help but be a little emotional about the achievements after all these years. My style was now accepted, my voice heard, and I could see some of it rub off on other crews. After Epic’s performance Angela Lau stopped the crew and asked me to come on stage. I was like, “Yo, I’m all the way up here! Crap.” So I ran up, ran across, hobbled down, skipped over some lady, bumped a dude’s beer, said hi to an old student, stubbed my toe, pushed my crotch into someone’s face, and finally I got on stage. Up to this point I really didn’t know what was up. 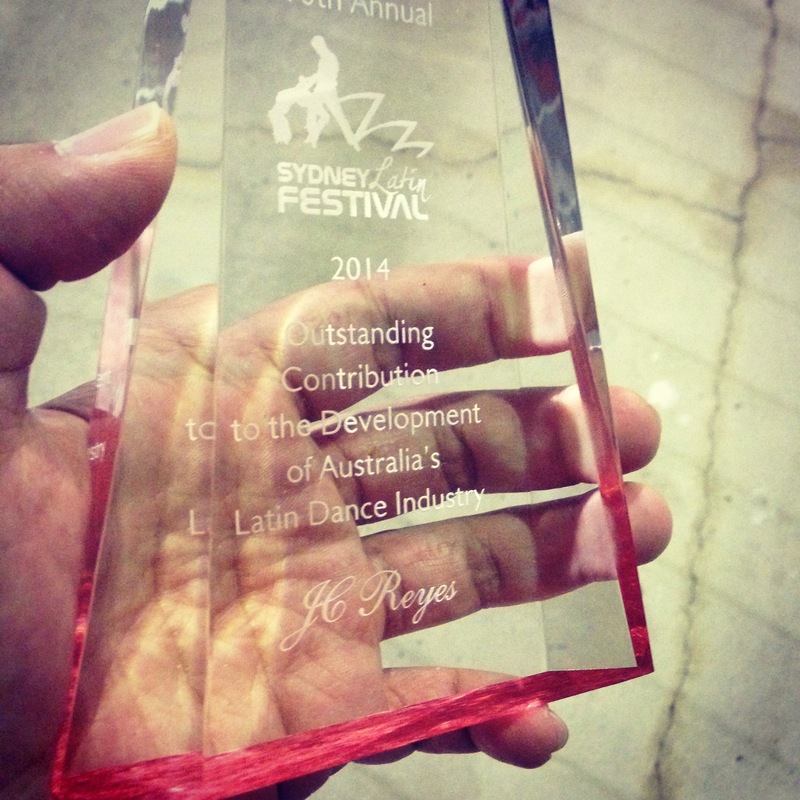 To my total and utter surprise, Angela awarded me with the “2014 Outstanding Contribution to the Development of the Australia’s Latin Dance Industry Award”. WTH??!!!. I walk on stage, the crowd’s noise die down, I am lost for words and I stumble to recite the most inspirational speech ever heard in the history of humanity. There is a long pause, one slow clap turn to two, two to three, three to a thousand, the music crescendos into an epic classical piece by John Williams as the tears and cheers fill the stadium. The camera rotates in a 360 degree action around me as I lift my award in the air. The place stands up in applause. People from other countries cheer enthically (is that a word?) as they witness my win through their third world fat televisions. A baby is born in a Nepalese hut. An eagle flies free. A father reunites with his long lost daughter. We then fade to a vision of a very slim and chiseled version of me walking away in the quiet dressing room tunnels of Olympic Park, the vision blurs to a pure white and an inspiring quote comes up next to my name. I’m sure that my movie-moment would have been great like that but that wouldn’t have been me. Instead my memory of it is being puffed from running all those stairs, stumbling through random thoughts, and being chased by an angry stage director as I walked off blurting out curse words while the microphone was still on and it was still in my hand. Thank You Jaime Jesus, Angela Lau, and Marcia Percival.